For the first time since my daughter was born five months ago I managed to finish a physical book (as opposed to an e-book or audiobook); it’s quite hard finding free hand time when you have a baby! I finally read my World Book Night book ‘The Martian’ by Andy Weir, and I wish I’d read it sooner because it’s brilliant. The book follows the story of Mark Watney, an astronaut stranded on Mars after the rest of his crew and ship leave in a dust storm thinking he is dead. It chronicles his struggle to survive in the planet’s inhabitable environment. This book should be really boring, it’s full of science and technical speak and details of one man fixing machinery; but somehow it manages to be thrilling and fascinating. I loved it! Watney’s voice is funny and acerbic and you root for his character so much because he doesn’t wallow in loneliness or despair, his attitude is positive and can do and it makes this a really uplifting, life-affirming read. 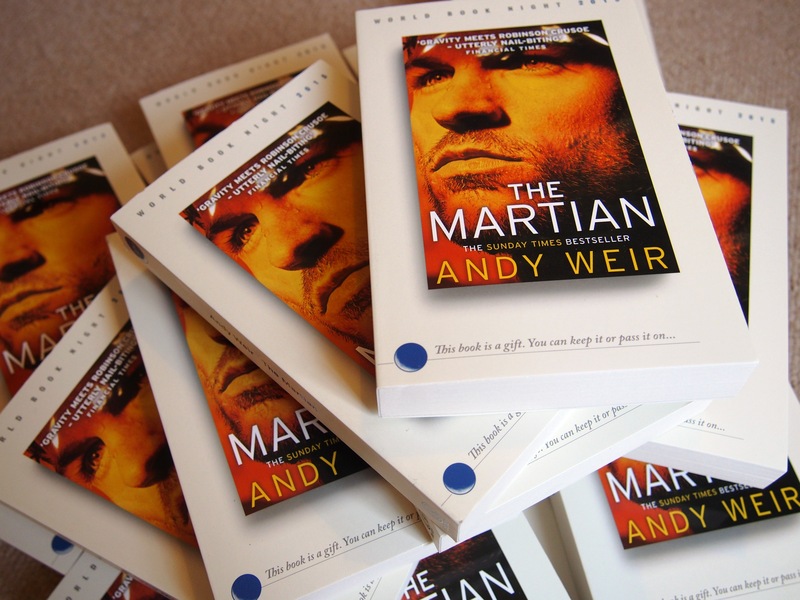 This year for World Book Night I have 18 Copies of The Martian by Andy Weir to give away. I’ve failed so far as I’ve been at home all day looking after my 9 week old, but hopefully I’ll do better over the coming days! I haven’t had a chance to read it yet as I only picked up my books a couple of days ago, but the bookseller at my collection point said it’s a great book for men, so maybe I’ll try to target men for my giveaways. I love World Book Night! It’s a fantastic idea and great to be a part of it.